Debutant Posh goalkeeper Stuart Moore can't quite reach a superb free-kick strike from Swindon's Nicky Ajose. Photo: Joe Dent/theposh.com. 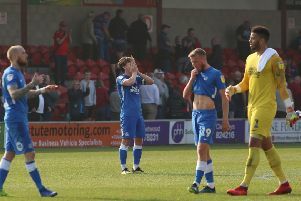 Peterborough United manager Graham Westley insists his side will emerge from the doldrums a much stronger, improved unit. It’s six defeats in seven League One matches for Posh - they’ve lost the last four - following today’s (February 27) 2-1 home defeat at the hands of Swindon. As a result Posh have plummeted into the bottom half of the table - they are 15th, although just eight points off the play-off places and 10 points clear of the bottom four. Marcus Maddison shoots Posh in front against Swindon from the penalty spot. Photo: Joe Dent/theposh.com. Manager Graham Westley was again forced to make numerous changes to his starting line-up, including the introduction of a new goalkeeper in Reading loanee Stuart Moore who replaced ankle injury victim Ben Alnwick after signing on a month’s loan from Reading less than 24 hours before kick-off. Westley believes ths constant changes are not helping his side. Posh have now lost four home league games in a row for the first time in two years. “Newness, change and youth are three very difficult things to deal with in any workplace,” Westley stated. “I saw some very positive things on the pitch today, but I also saw far too many errors which is partly a result of that newness, change and youth. “Was there indecision in our back line? 100% yes. Did we defend too deep at times? 100% yes. That was a result of having a new goalkeeper who had never met his team-mates before. Relationships have to grow and develop, although I felt Stuart had a decent debut. Teenage Posh substitute Leo Da Silva in action against Swindon. Photo: Joe Dent/theposh.com. “We have a lot of good players on the sidelines though. Once they are back and involved you will see some of these younger players improve quickly. At the moment we are in the middle of a massive period of change and a massive period of difficulty, but we will come through it together and we will be better for it. “We did some great things in possession over the 90 minutes. I’ve stood in front of the media after games before and said we would have scored a hatful with greater clinicality and that was definitely the case today. “The best part of our game was with the ball, but the worst part of our game was when we were out of possession. We didn’t show enough defensive discipline or enough technical ability to keep Swindon at bay. Individually we defended okay, but as a unit we were not so good. “It was too easy to run past too many of our players and when that happens you create overloads and overloads can hurt you. “We were always in this game. We struggled in the early part of the second half when they changed their shape and started to come at us, but we were beginning to exert ourselves again when we conceded the winning goal. “There are very fine margins in football and when you are on a bad run they always seem to go against you. That happened today as we missed a great chance to go 2-1 up ourselves and then had a goal disallowed. Within 60 seconds they have scored the winning goal. They were clinical, we weren’t and that’s why they take the points. “Gaby Zakuani felt he didn’t foul anyone for the ‘goal’ we had disallowed. That’s the view I had also, but we can’t blame the officials as we had the chances to score other goals. Posh are back in action at Bury on Tuesday (March 1) before facing a daunting task at in-form promotion favourites Wigan next Saturday (March 5). Michael Bostwick is available for the Bury game after completing a two-match suspension and Westley didn’t rule out the return of Jon Taylor (knee), Lee Angol (thigh strain), Jack Baldwin (dead leg), Chris Forrester and Kgosi Ntlhe, all of whom missed today’s game because of injury. There’s every chance 17 year-old midfielder Leo Da Silva Lopes will be involved at Gigg Lane. He impressed Westley with his performance as a second-half substitute today.